Spring is here along with a whole palette of new colors. Fresh flowers are popping up all over the place making those bare trees bright with blossoms and yards burst with brilliant hues. This time of year reminds me of the vibrant paintings of Gustav Klimt and how he captured the freshness of spring in his dreamy artworks. 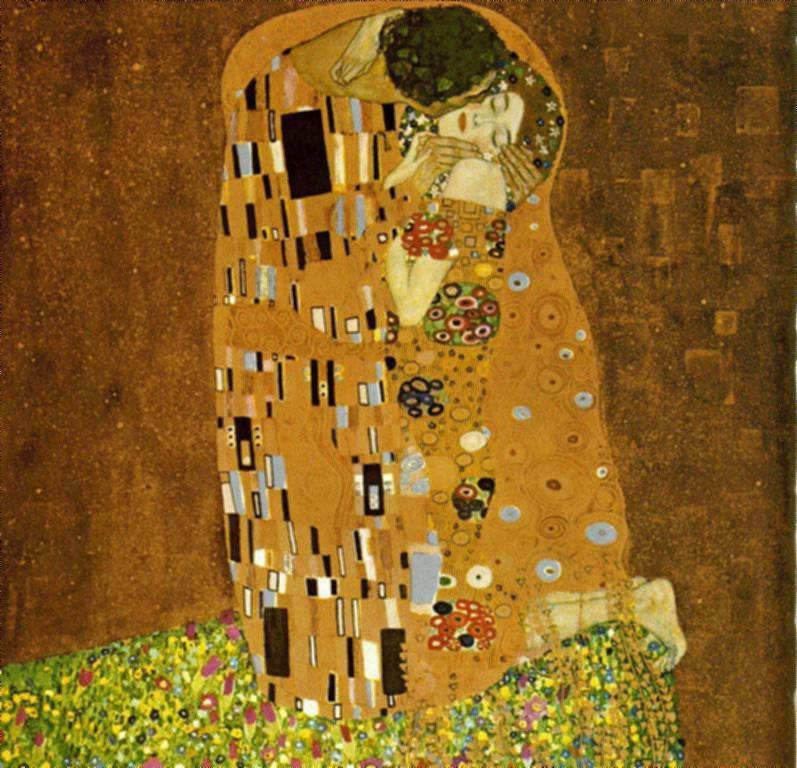 When most think of Klimt, his famed The Kiss comes to mind, but in actuality, Gustav loved the flowers, and many of his artworks were filled with them. Our friend Gustav Klimt grew up in Austria and was one of the founding fathers of the decorative Art Nouveau style. His expressive and moving artworks were based on his life experiences with love, death, and more and more love. Let’s just say many of his paintings are sensual in style, full of rich color and soothing lines. With all those spring flowers popping up all around, I figured it was a wonderful opportunity to create a beautiful blossoming artwork with the wee tot! We started by examining some of Klimt’s flower paintings up close and personal via the Internet. On of my favorites, Farmergarden with Sunflower is a sea of green with brilliant dots of colorful flowers shining through. We had fun trying to count all those flowers and naming the colors, too. This is a great way to promote language and math skills with your child, too! 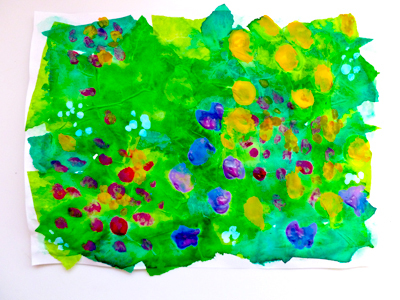 Then it was time for making our own Gustav Klimt painting to showcase all the spring flowers around our home. Before hitting the paints, I shuffled the babe outside for an interactive walk around the neighborhood to see what colorful flowers we could see. I even brought along a cutter to trim a couple of stems to use for inspiration. Back at the house I put our spring flowers in a vase and got out a sheet of white paper. But, instead of using plain green paint, I had the babe tear some shades of green tissue paper to make things a touch more interesting. Not only is tearing fun, it hones your child’s fine motor skills! Once you’ve got a nice pile of green shreds, you can offer your child a small dish with a mix of water and glue along with a paintbrush for slathering the stuff all over the place. Invite her to wash her paper with glue water and then press those pieces of tissue around her paper. She can paint over them again securing all that green to her paper. Once she’s finished with tissue and glue, invite your child to select some of her favorite colors of paint to use for making her spring flowers. Now she can dab, dab, and dab her paint filled brush all over the green tissue paper to create a garden full of flowers, just like Gustav Klimt! Her finished flower creation can be put in a frame and proudly displayed in the home reminding everyone, no matter the time of year, how wonderful spring can be. Naturally dyed eggs – for Easter or whenever! love. love. LOVE. yer a gal after my own heart pointing out all them fantastic developmental skills. thank you! i found you through pinterest and yay for new blog reads!